According to a recent report, veteran Columbus Blue Jackets defenseman Jack Johnson has requested a trade to a team where he can play a more prominent role and position himself better for the upcoming 2018 free-agent season. With such defensemen likely to be in particularly abundant supply and demand at the deadline, what kind of transaction can we expect? Within NHL front offices, Johnson is a highly regarded two-way defenseman with a strong physical presence. He was selected third overall by the Carolina Hurricanes in the 2005 draft, the same draft in which Sidney Crosby was selected first overall. Though he has never received a vote for either the Norris Trophy or the end-of-season All-Star team, Johnson was chosen for the star-studded Team USA that won the silver medal at the 2010 Olympics, and also for the 2016 World Cup of Hockey. His NHL teams have yet to win a playoff series, but Johnson is still believed to be a big-game performer because of his success in those international competitions, and because he leads active defensemen with an average of 0.91 points per game in the playoffs (21 points in 23 games). Despite these impressive credentials, Johnson may be one of those players whose reputation is in conflict with his underlying numbers. While he unquestionably has handled some of the league's toughest minutes over the years, there is some dispute about how effective he has been in that No. 1 role, and that it may be far more appropriate for him to remain further down the depth chart. After being acquired from the Los Angeles Kings along with a first-round pick for Jeff Carter on Feb. 23, 2012, Johnson assumed a role as the team's No. 1 defenseman. From Day 1, he was buried in tough minutes in the defensive zone and against top opponents on the team's otherwise weak blue line. In a situation that bears a resemblance to Rasmus Ristolainen in Buffalo today, Johnson seemed to struggle in that overly ambitious role, and his shot-based metrics were consistently among the worst in the NHL. Another blockbuster trade turned the tide in Columbus, when Seth Jones was acquired for Ryan Johansen on Jan. 6, 2016. Later that season, Jones formed the team's new top pair with rookie Zach Werenski, who was selected eighth overall in the 2015 draft. With Jones and Werenski helping to shoulder the burden as a highly effective offensive-minded pair, Johnson was able to slide down the depth chart and partner up with veteran David Savard as the team's more defense-oriented pair. Statistically, Johnson appears to be far more effective in this new role. While plus/minus is not a perfect stat, the fact that Johnson went from a league-worst career minus-126 to a plus-23 in 2016-17, which was tied for No. 16, is a valid indication of that improvement. For a more detailed demonstration of how Johnson's role has changed and its impact, consider the following player usage chart from the Hockey Abstract 2015 Update, prior to the season in which Jones was acquired. 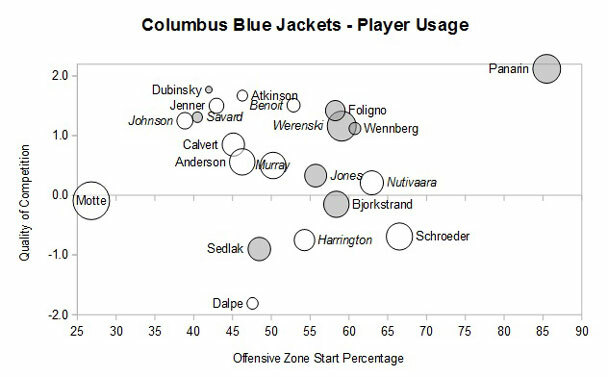 Located almost completely by himself among defensemen (noted in italics) in the top-left corner of the chart, Johnson was taking on the team's top opponents (vertical axis), primarily in the defensive zone (horizontal axis), and with the kind of large white circle that represents how the team's shot-based metrics were suffering as a result. Two seasons later, compare how the situation on the team's blue line has changed in the following player usage chart from Hockey Abstract 2017. Now Johnson has Savard's company on the left side of the chart, and Werenski's position at the top of the chart demonstrates how the offensive-minded pair is sharing the burden of taking on top opponents. While Johnson's own shot-based metrics haven't improved, the top four as a whole has been much more effective, based on the nicely shaded circles of its three other members. While Johnson appears to be unhappy with his reduced role, it actually makes the timing ideal for a trade, from the team's perspective. 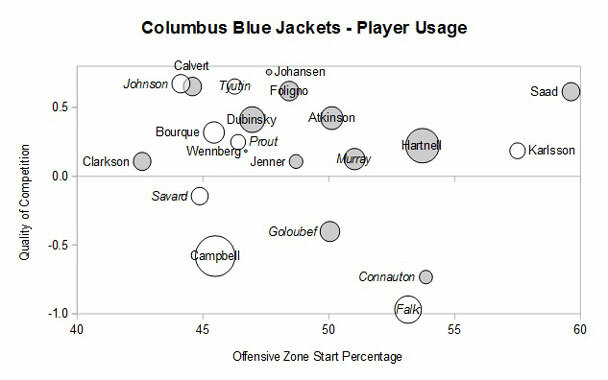 Not only is it easier for Columbus to move someone who isn't carrying the entire weight of the team's blue line on his shoulders anymore, but his new role has effectively minimized the negative impact of his shot-based shortcomings. Yes, Johnson carries a hefty cap hit of $4,357,142 this season, but that is the going rate for second-pair defensemen, based on how the market was set this past summer. Just a few months ago, veteran free-agent defensemen such as Brian Dumoulin, Dmitry Kulikov, Karl Alzner, Michael Stone, Brendan Smith, Kris Russell, Dan Girardi, Trevor Daley, Justin Schultz and Dmitry Orlov all signed multiyear deals with an average cap hit of $4.167 million, and arguably none of them would be slotted any higher on a depth chart than Johnson. If a team wants someone like Johnson, then that's the amount of cap space that they will need, no matter who they target. Where will Johnson land? Columbus's ideal trading partner will have the need for a top-four defenseman and the cap space required, and be the kind of playoff-bound team that needs to act now, rather than wait to sign Johnson in the summer. As an added complication, the potential trading partner will also need to have the pieces the Blue Jackets require right now, since Columbus is a likely playoff team too. Chances are, the right enticement would be to offer Columbus some help on the power play. This season, Columbus' power-play percentage of 13.5 percent ranks second-to-last to the Buffalo Sabres' 12.9 percentage. That's why the most intriguing trading partner may be the Toronto Maple Leafs. They have some pending free agents of their own who can contribute on the power play, such as James van Riemsdyk and Tyler Bozak. According to the data compiled at Corsica Hockey, van Riemsdyk's 5-on-4 scoring rate of 6.04 points per 60 minutes ranks ninth among those to play at least 200 minutes between 2015-16 and 2017-18, and Bozak ranks No. 50 with 4.89. Given the upcoming cap requirements to sign William Nylander (2018), Mitch Marner (2019) and especially Auston Matthews (2019), it's likely that at least one of these two veteran free agents don't figure into the team's long-term plans and can be spared at the deadline. Johnson could make all the difference for Toronto. As demonstrated in the following player usage chart from Hockey Abstract 2017, a top-four defenseman who can handle tough minutes may be the final piece to lift the team to the status of a legitimate Stanley Cup contender. 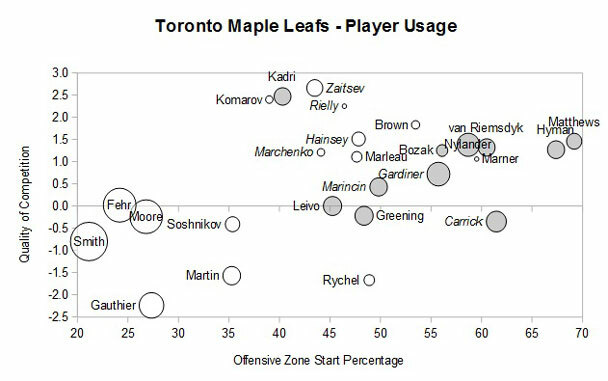 Located at the top of the chart, Morgan Rielly can effectively handle top opponents in both zones, but the white circles suggest that Nikita Zaitsev and Ron Hainsey might be more effective in a different role, such as on the third pair, or on more of a Jones-Werenski type of pairing, with Jake Gardiner. While Johnson's cap hit and poor shot-based metrics don't make him an ideal long-term solution, he may prove to be the best short-term fix. And, if Johnson does achieve the right chemistry with Rielly, then the team can start negotiating with him in advance of the 2018 free-agent season. While not the perfect solution for either team, sending Johnson to Toronto is a reasonable example of a trade-deadline possibility that could help both teams -- especially if the Blue Jackets can get some power-play help in return. Since there are several teams who may be looking for a veteran top-four defenseman down the stretch, such as the Vegas Golden Knights and the Kings, and because there are likely to be several alternatives available, such as Niklas Hjalmarsson, Mike Green, Dion Phaneuf and Paul Martin, it is impossible to determine which team will ultimately be the destination for Johnson. But wherever he lands, he will likely be more effective for his new team if he is used in a role similar to his current one than if he is used as a No. 1 defenseman.